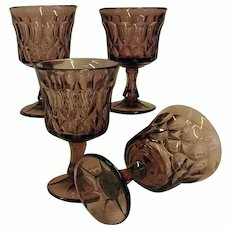 Fakers and forgers are now using a new method to alter the color of antique and collectible glassware. It is called irradiation. Rather than changing the color of an object by covering its surface with paint or some other external coating, irradiation changes glass internally within the very atoms of the glass. 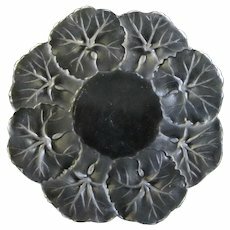 Most pieces being altered are genuinely old authentic pieces. 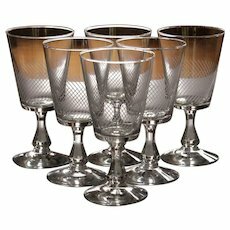 Forgers buy these old pieces in the most common and least expensive colors. The pieces are then irradiated to produce "rare" or "unlisted" colors which command premium prices. 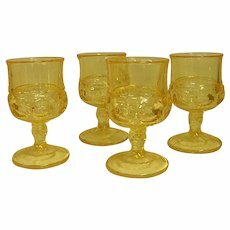 Why would anyone want to alter the color of antique glassware? Let's look at some examples. 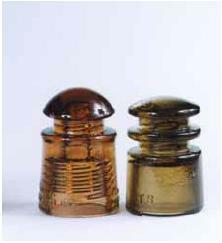 A lowly glass telephone insulator, for example, in common clear or aqua sells for $1-$4. 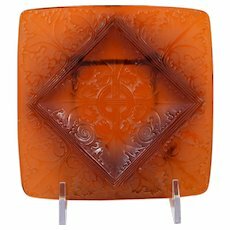 The very same pieces in unusual colors, say orange, can sell for as much as $50-$75. 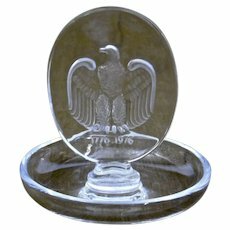 Common Masons Patent 1858 fruit jars in ordinary colors sell for under $10 each. 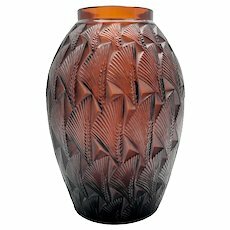 At a Chicago bottle show, a lot of three of those same jars in an unusual amber brought $1,000. 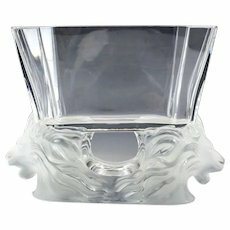 A clear frosted Lalique chevaux (horses) vase generally sells for $2,000-$3,000. 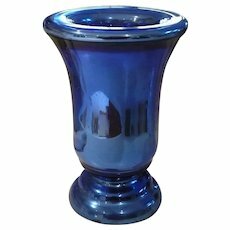 In deep purple, the same vase sold for $20,000. 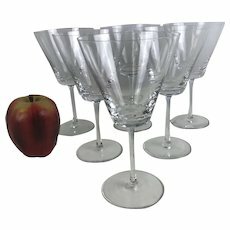 In each of the above cases, refunds were made because the glass was later proved to be irradiated. 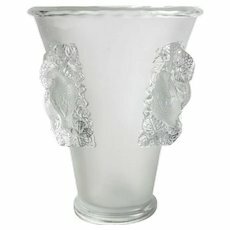 Slightly altering the color of collectible and antique glass is nothing new. 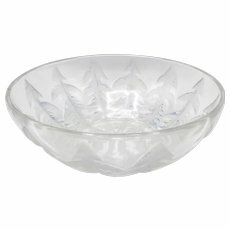 Old clear glass exposed to sunlight changes to a pale lavender. 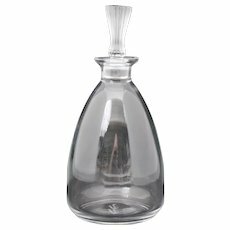 Bottle collectors have known for years that glass exposed to shortwave ultraviolet lights in a box for 3-4 weeks can produce the same color. What we found was surprising. 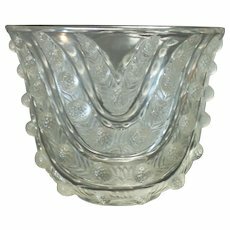 Yes, the color of antique and collectible glass is easily changed by irradiation. 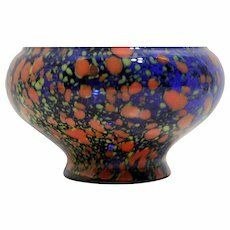 Even more surprising was that irradiation has been used to color glass commercially for over 25 years. The technology has been widely described in numerous speeches, articles and technical journals. 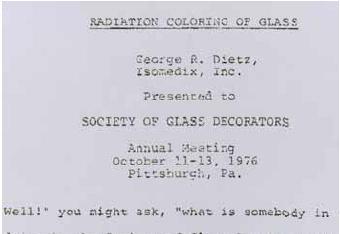 In October of 1976, for example, nuclear engineer George Dietz discussed glass irradiation at the Society of Glass Decorators annual meeting in Pittsburgh, Pennsylvania. Research has been particularly strong in the Czech Republic (Fig. 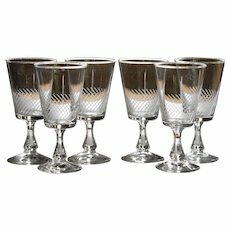 4) where the glass industry forms a large part of the national economy. Advertising brochures promote glass irradiation by emphasizing its low per unit cost, ease of processing and years of successful results (Fig. 5). 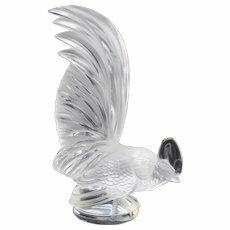 Irradiation offers commercial glass manufactures several advantages. 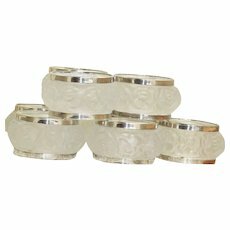 Glass can be colored right in the packing cartons, there is no need to remove it for treatment. 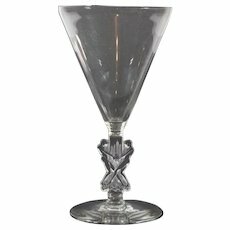 Glass makers can basically get two colors from a single glass batch. 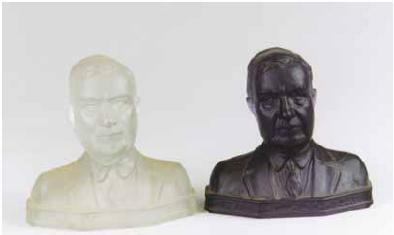 The original color and a second color produced by irradiation. 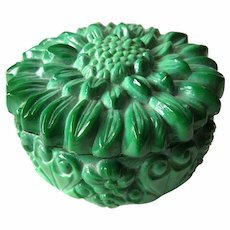 If a designer container doesn't sell well in the first color, it can be marketed in another color. 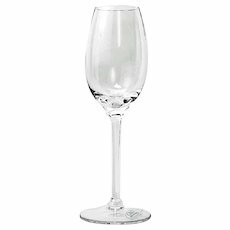 Facilities capable of irradiating glassware are generally corporate owned commercial business ventures. Some are affiliated with colleges and universities for institutional research or teaching. 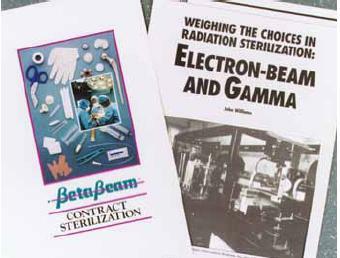 Although most irradiation facilities are capable of altering the color of glass, their major source of revenue is from sterilizing equipment and instruments in the health care field. 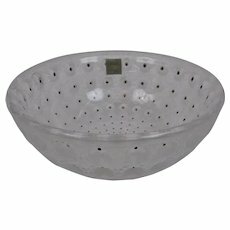 Seeds, fruits, vegetables, meats and processed foods are also sterilized to prevent spoilage and increase shelf life. 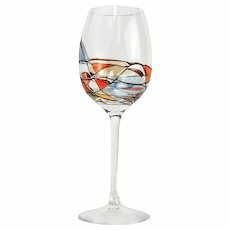 Other uses include industrial quality control and marking, changing colors of gemstones and, of course, coloring glass. Commercial irradiation facilities are available to anyone who can pay the fee. Fees are typically based on hourly rates, per piece or cubic volume. ACRN paid $250 per hour for the use of one irradiation facility. 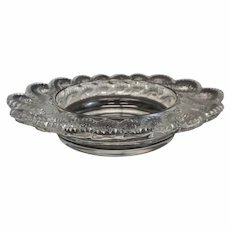 ACRN paid about $10 per piece at another. Large volume commercial runs can be irradiated for costs of less than ten cents per unit for 8 ounce bottles. 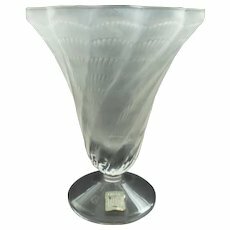 The process of irradiating glass is quite simple. Glass is loaded on conveyor belts, carts or some other type of automated transport system. 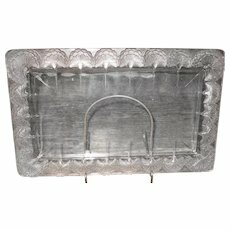 It is then carried into a vault or chamber for exposure to irradiation. After exposure, the material exits the chamber for unloading. See Figs. 6-10. Irradiation simply means exposing an object to invisible waves of high-energy particles. 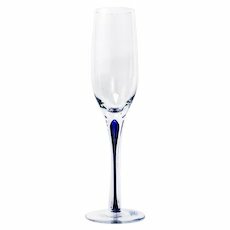 The two sources most often used to irradiate glass are gamma rays, the most widely used, and electron beams. Gamma rays are produced by Cobalt 60 (60CO) a radioactive isotope. Electron beams are generated in a mechanical instrument called a particle beam accelerator. Gamma rays and electron beams add energy to glass atoms and disrupt the atomic structure. 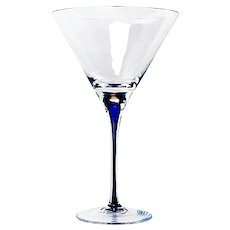 This disruption affects the atoms' ability to transmit light and thereby changes the color of the glass. That's the short explanation. For readers who want more details, see Technical Note #1, page 144. 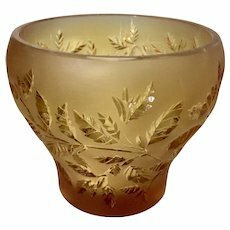 Irradiated glass is not radioactive. It is perfectly safe to handle at any time even immediately after treatment. Having your teeth X-rayed at the dentist doesn't make them radioactive. Similarly, neither gamma rays or electron beams make glass radioactive. 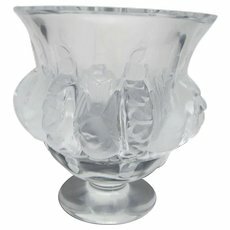 The color antique and collectible glass changes depends on several factors. These include 1). 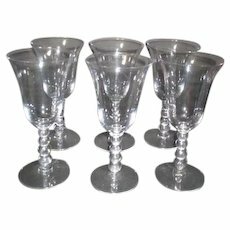 the basic type of glass formula (soda-lime, lead, etc); 2). original ingredients intentionally added to the glass batch (for coloring, etc. 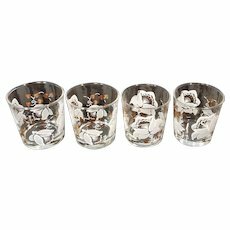 ); 3) impurities unintentionally included in the glass; and 4). exposure level (time/intensity of irradiation). 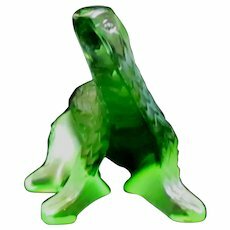 As with all glass, thick pieces appear darker colored than thin pieces. 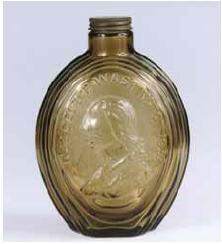 Manganese for example, was widely used in pre-1930s clear pressed glass to mask or decolorize impurities. 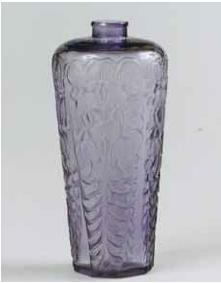 When irradiated, antique glass with manganese turns deep purple. 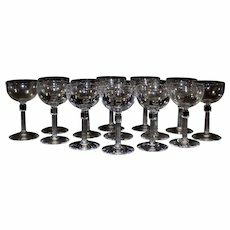 Antique glasses are capable of turning many other colors. It is not known exactly what elements, other than manganese, produce what color changes. 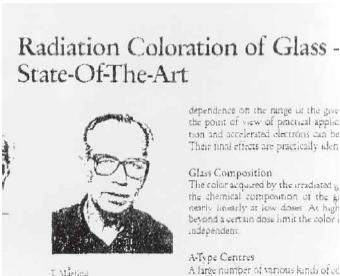 Technical journals written on glass irradiation discuss only late 20th century present day glass formulas, not old glass formulas. 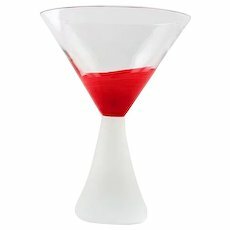 Modern glasses have a limited range of color change. 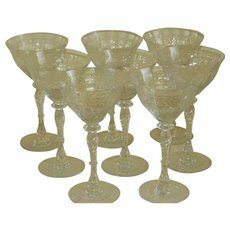 Clear colorless modern glass generally changes only to amber, brown or a very deep brown that appears black. The exact color depends on the exposure. 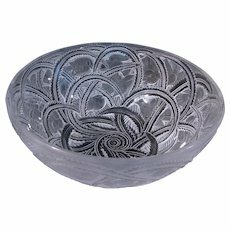 Altogether, ACRN had about 200 pieces of antique and collectible glass irradiated by electron beams and gamma rays (Figs. 12-19). 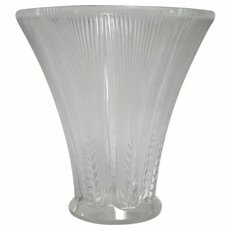 All types of glass--transparent, translucent and opaque, colored or colorless--can be altered by irradiation. 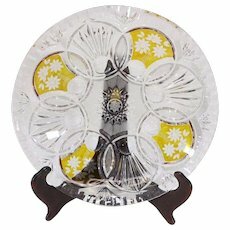 Surface decorations such as paint or enameling usually retain their original colors. 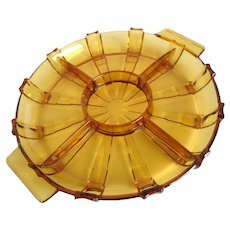 Contrary to rumors, a Geiger counter cannot be used to detect irradiated glass. 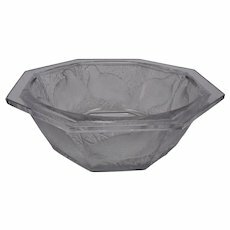 Irradiated glass, remember, is not radioactive. 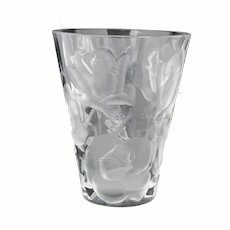 Determining whether a piece of glass has been irradiated is not easy. 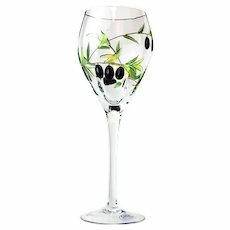 A small portion of the glass must be tested in a laboratory which can cost $125-$250. 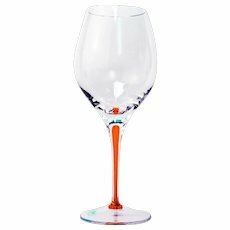 The tests determine whether the glass' color is created by chemical ingredients or irradiation. The element manganese, for example, was used both as a decolorizer and a coloring agent. When used as a decolorizer, it shows up as less than 1%, usually only a few tenths or even hundredths of one percent. When used as a coloring agent to intentionally make glass purple, however, manganese content rises to 4% to 30%. 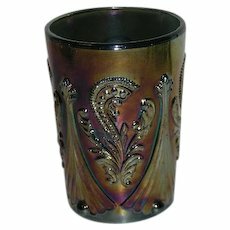 Thus if a piece of deep purple glass is tested and found to contain less than 1% manganese, it has been irradiated. A simpler less expensive test is to heat the suspected item. 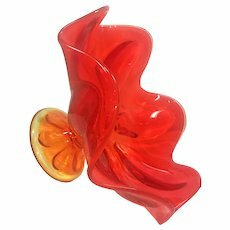 Depending on the glass formula, the color will begin to fade at about 300 to 700 degrees F. This generally returns the glass to its original color usually within an hour. 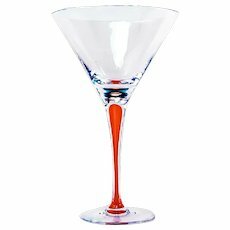 The higher the original melting point of the glass, the higher the temperature required to reverse the color. 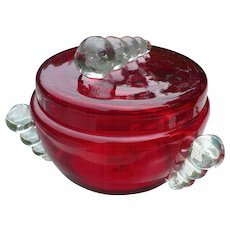 Fruit jars, for example, made of heat resistant glass required temperatures approaching 600-800 degrees F to reverse the color. 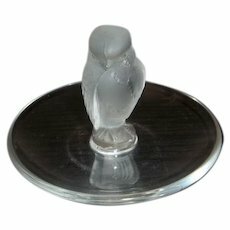 This test is not without danger because too sudden an increase or decrease of temperature may damage the item being studied. 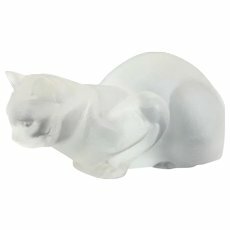 Another test, although less reliable, is to simply place the suspected piece in direct sunlight (ultraviolet light) which will cause the color to fade. 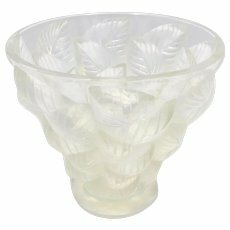 By far the largest dollar impact of irradiated glass has been fraudulent Lalique. 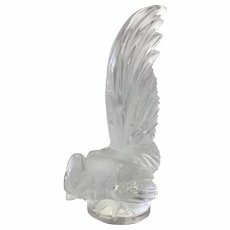 New York dealer and Lalique specialist David Weinstein assisted ACRN's investigation by providing numerous pieces of original clear Lalique for experiments. 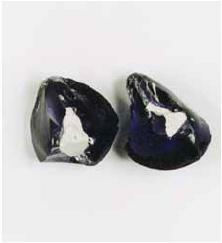 After ACRN's tests turned these pieces purple, Weinstein took one to Sothebys in New York. 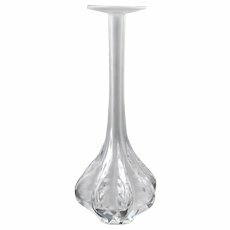 Weinstein says he was refunded $20,000 for a purple Lalique chevaux pattern vase he had purchased at Sothebys. 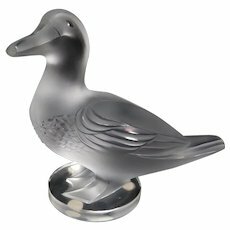 It is also rumored on the street that Sothebys has refunded $40,000 for a purple Lalique perruches (parrots) vase and $50,000 for a purple Lalique peacock radiator ornament. ACRN asked for comment on the refunds but Sothebys press office did not return phone calls. 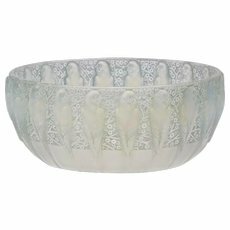 In court papers filed in England, London dealer Mark Waller is alleged to have sold a collection of non-genuine purple Lalique hood ornaments to a Geneva, Switzerland customer. The monetary value of that case is estimated to be over $250,000. 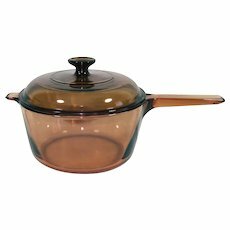 A number of confirmed refunds have been made for fruit jars in the $200-$500 range. 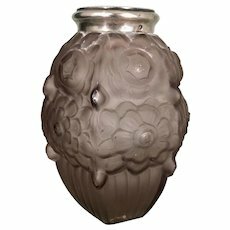 The true extent of requests for refunds is difficult to estimate because most dealers and auction houses are unwilling to discuss irradiation. 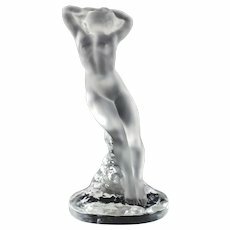 Weinstein urges caution when consulting reference books on purple Lalique. 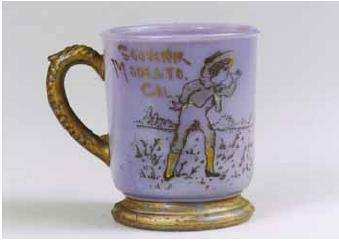 "When my purple vases appeared in the Dawes book, (Fig. 20) I believed they were authentic. Now I'm convinced they were irradiated," says Weinstein. 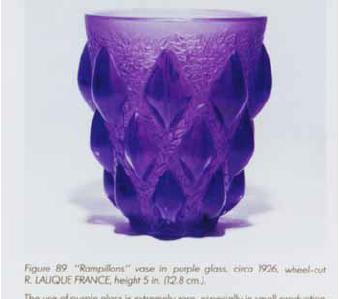 Weinstein points out that prior to the late 1980s, deep purple Lalique had never been seen. 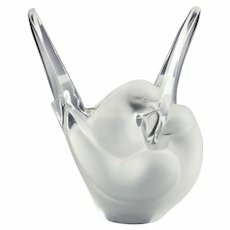 "I think my Rampillons [vase in the book] was a fake." 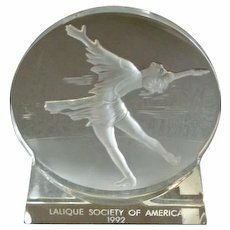 The only other reference book "rare" deep purple Lalique appears in is The Art of Rene Lalique co-authored by Mark Waller, the same person named in the English lawsuit. 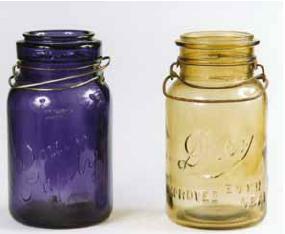 Fruit jar dealer Gene Rice of Goshen, Indiana has said he changed the color of roughly 7,000 jars in one year with irradiation. 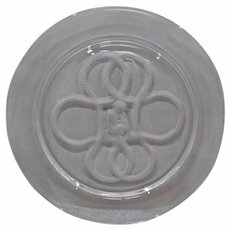 There is currently a collection of 40 pieces of deep purple Lalique being shopped around for $360,000. 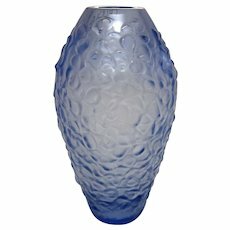 Weinstein estimates he knows of over 100 pieces of purple Lalique that have changed hands at major auction galleries or through private dealers. 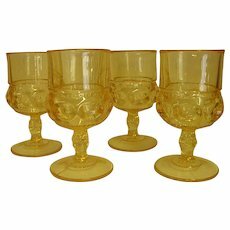 No one knows for sure what types of glass have been irradiated, how many pieces are involved or for how many years this has been going on. 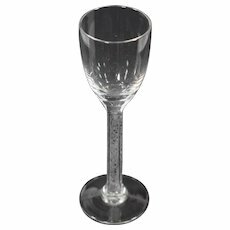 ACRN thinks irradiation is a threat to any types of glassware where color produces large differences in prices. 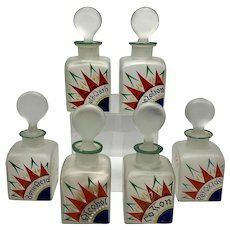 Depression era glassware, sulphide marbles, Czech perfumes, cut glass and early American pressed and blown glass, especially bottles and flasks, are all likely targets for this type of fraud. 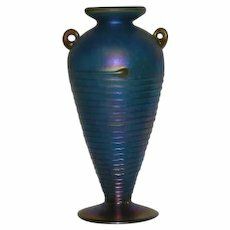 It is not within the scope of this article to determine how widespread irradiation has become in the antiques market. 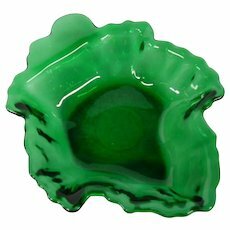 The purpose of this article is to make buyers aware that a technology exists to make color changes to genuinely old authentic glass. This technology, unlike other types of forgeries, can easily remain undetected without sophisticated laboratory testing. 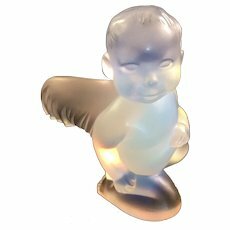 Insist that sellers document "rare" colors by original factory records, similar examples in museum or personal collections and an established history of confirmed examples. Keep in mind that the colors discussed in this article are not the only colors that may be created by irradiation. Insist on written receipts that include date of creation. If you buy an item specifically for the color, be sure the color is included in writing on the receipt. 1. 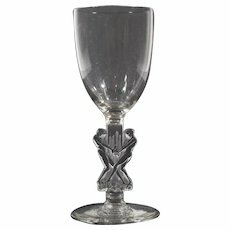 Clear colorless glass decolorized with manganese turns brown or purple when exposed to electromagnetic radiation. This can be ultraviolet light (sunlight) or the high energy particles produced by gamma rays and electron beams. The name for the reaction which produces the color change under sunlight is called solarization. The same type of changes to the atomic structure occur from irradiation produced by gamma rays and electron beams. 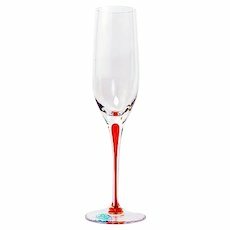 The color change is caused by the reaction between the manganese and iron present in the glass. Absorption of energy causes the manganese to give up one electron. Changes in the atomic structure by the absorption of energy and the liberation of electrons cause other color changes in other ingredients in a similar manner. 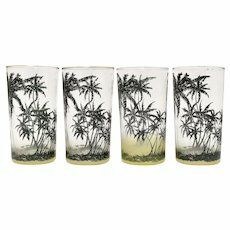 Irradiated glass is not radioactive. 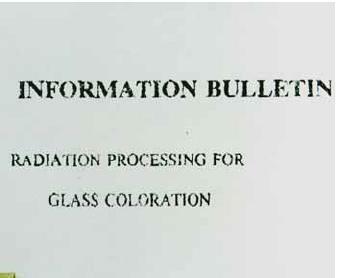 Irradiated glass cannot be detected by a Geiger counter. 2. ACRN's glass samples were irradiated at the Linear Accelerator Facility on the campus of Iowa State University, Ames, Iowa using an electron beam. 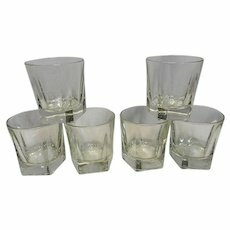 Additional glass samples were irradiated with gamma rays by Isomedix Corporation. 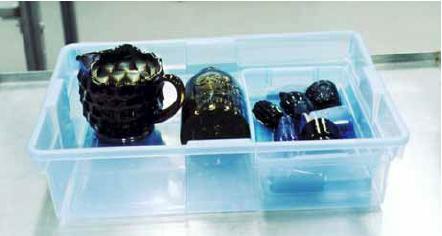 Glass samples were tested for chemical composition by the Materials Analysis and Research Lab at Iowa State University. Fig. 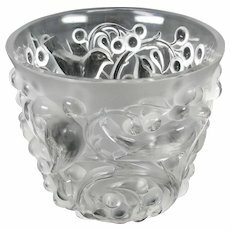 1 All these pieces were originally clear colorless glass. 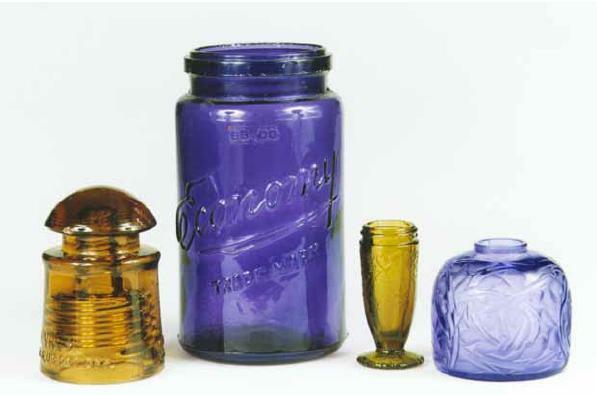 After irradiation, the insulator is now orange, the fruit jar purple, the depression glass shaker is olive amber and the Lalique perfume bottle purple. Fig. 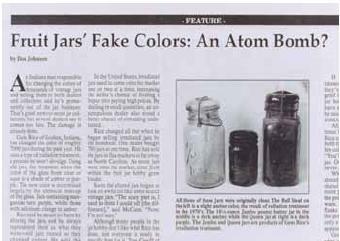 2 Rumors of using nuclear technology to color fruit jars were mentioned in a Maine Antique Digest, March 1995. Fig. 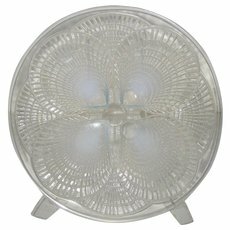 4 One of a series of articles on irradiating glass. Z. Prasil, Institute for Research, Production and Application of Radioisotopes, Prague, Czech Republic. Co-author T. Märlind. Fig. 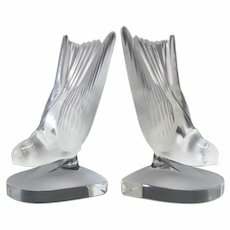 5 Glass irradiation is one of the services offered by commercial irradiation facilities. 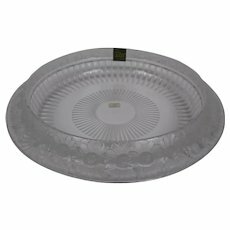 This bulletin is by Isomedix Corporation which has over 20 years experience irradiating glass. Fig. 6 Interior of electron beam irradiation facility. This particular facility specializes in irradiation of foods primarily meat. Fig. 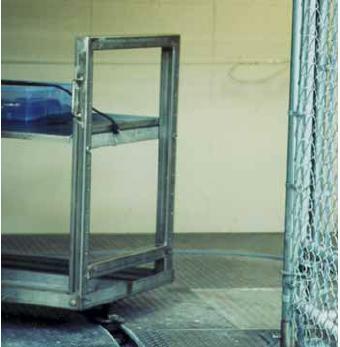 7 Ordinary plastic tub is loaded with glass samples and placed on stainless steel cart in preparation for irradiation. Fig. 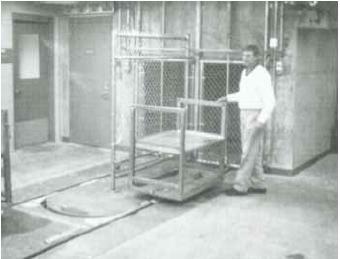 8 Cart automatically travels along track in floor to carry glass into irradiation chamber. Fig. 9 Alarms and warning signs are activated before the irradiation process begins. 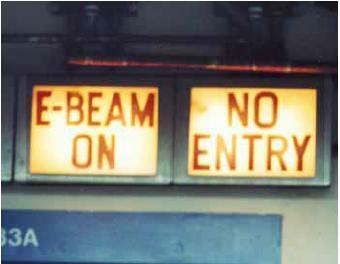 E-Beam stands for electron beam. Fig. 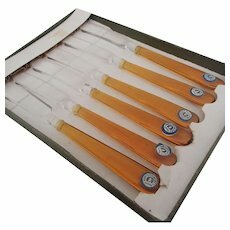 10 Same tub of glass samples after being irradiated. 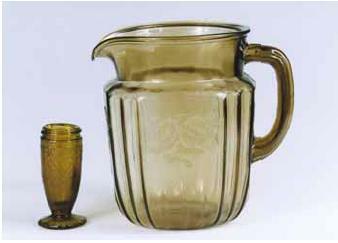 Irradiated glass is generally safe to handle immediately after treatment. 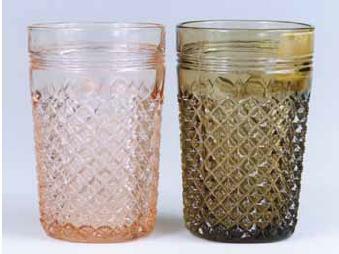 Irradiated glass is not radioactive or contaminated in any way. Fig. 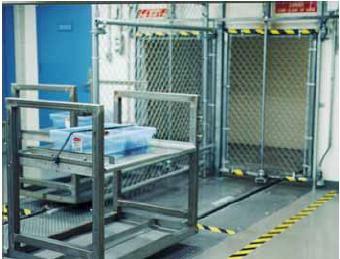 11 The majority of work at commercial irradiation facilities is sterilization of medical equipment, supplies and instruments. Fig. 12 Irradiated fruit jars can turn many colors. 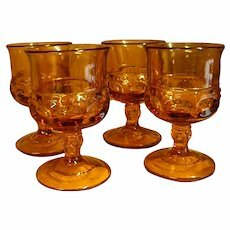 These are purple and honey amber. Other colors include cobalt and dark green. Fig. 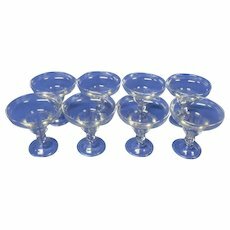 14 Clear glass sulphide marble fragments turned blue. Clay remained white. Fig. 15 Clear commemorative Washington bottle turned amber. Fig. 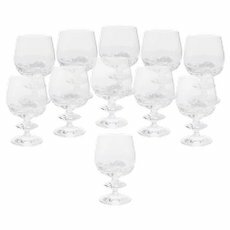 16 Clear and aqua insulators turned many colors. These are orange and olive. Fig. 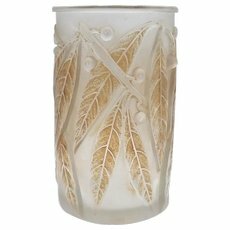 17 Milk glass mug turned pale blue after irradiation. The original gold paint decoration was unaffected. Fig. 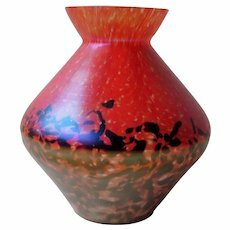 18 Florentine shaker turned unusual olive amber and Mayfair pitcher turned unusual pale amber. Fig. 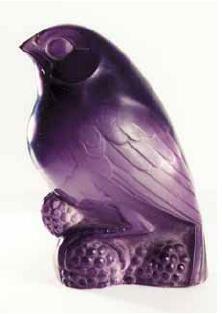 19 Solid glass Lalique bird turned deep purple by ACRN's irradiation tests. Fig. 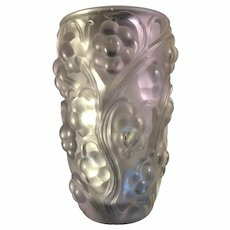 20 David Weinstein is now convinced his purple Lalique vase shown in Nicholas Dawes' book Lalique Glass is an irradiated fake. Fig. 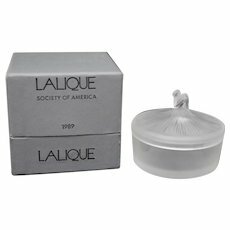 21 Originally clear Lalique perfume bottle turned puple by irradiation. Fig. 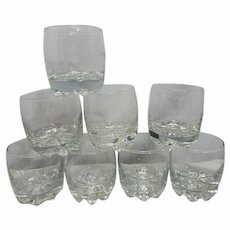 22 Miss America depression glass tumblers. Original pink, left; a strange yellow-orange color after irradiation, right. Fig. 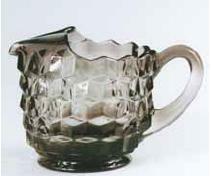 23 Clear Fostoria pitcher turned a dark gray after irradiation. 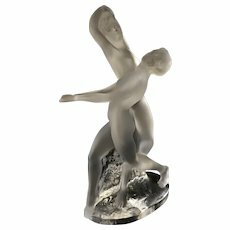 Deux Danseuses - Two Dancers. 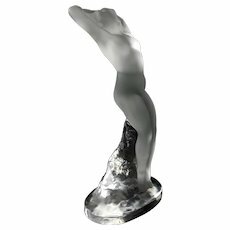 Beautiful Lalique Glass Figurine. 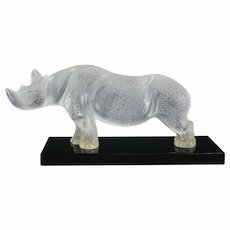 Lalique Art Glass Rhinoceros TOBA Figurine, acid etched, on black glass plinth. 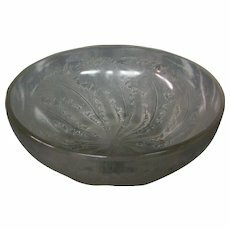 LALIQUE France GERANIUM Leaf Frosted Crystal Glass Plate Dish 5 3/4"